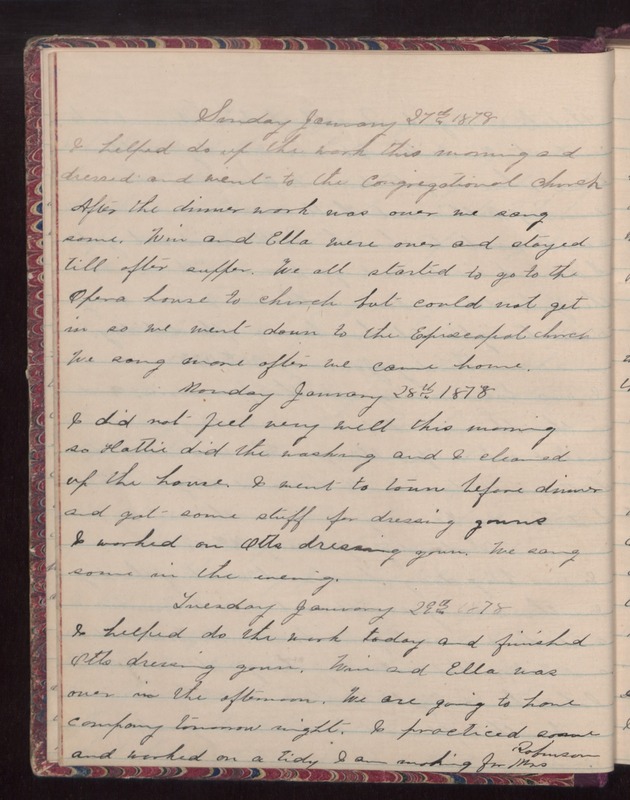 Sunday January 27th 1878 I helped do up the work this morning and dressed and went to the Congregational Church. After the dinner work was over we sang some. Win and Ella were over and stayed till after supper. We all started to go to the Opera house to church but could not get in so we went down to the Episcopal church. We sang more after we came home. Monday January 28th 1878 I did not feel very well this morning so Hattie did the washing and I cleaned up the house. I went to town before dinner and got some stuff for dressing gowns. I worked on Otts dressing gown. We sang some in the evening. Tuesday January 29th 1878 I helped do the work today and finished Otts dressing gown. Win and Ella was over in the afternoon. We are going to have company tomorrow night. I practiced some and worked on a tidy I am making for Mrs Robinson.